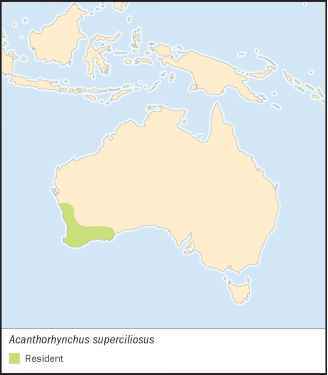 Acanthorhynchus superciliosus Gould, 1837, Perth, Western Australia. 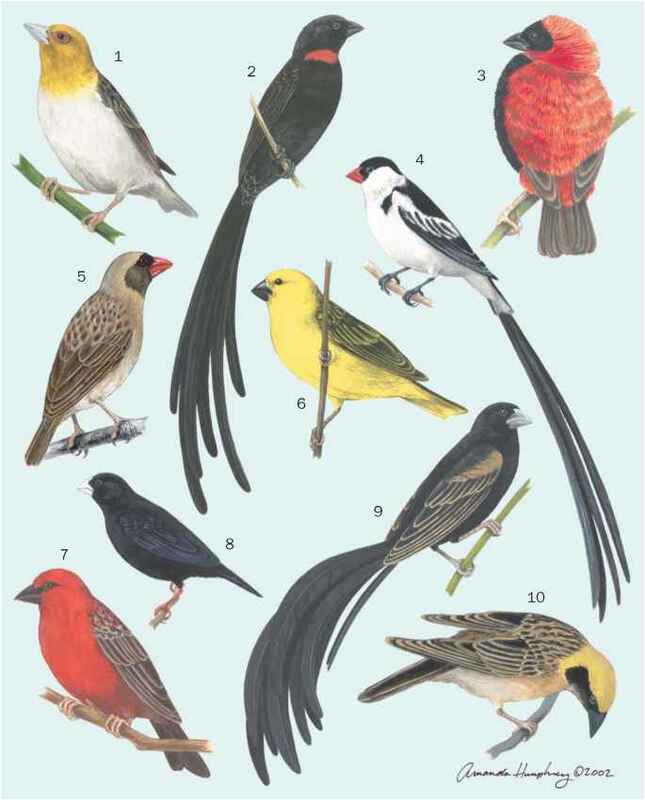 English: Western spinebilled honeyeater; French: Méliphage festonné; German: Buntkopf-Honigfresser; Spanish: Pico de Espina Occidental. 5.5 in (14 cm); 0.35 oz (10 g). Head black, back and wings grayish. Rufous band behind neck, and from throat to breast. Underparts light gray with black and white bands below breast. White bands behind bill and eye. Heathland, woodland, and open forest with heathy understory. Sometimes in mallee, rarely in gardens. Active. White outer tail feathers conspicuous in flight. Produce audible wing beats. Exhibit flight displays, frequent rapid and erratic chases, and male displays to female by fanning tail. Emit twittering and whistling calls and song. Poorly understood movements, perhaps local and in response to flowering patterns of plants. Probe flowers of banksias, eucalyptus, and numerous shrubs, including Dryandra, Grevillea, Adenanthos, and Calothamnus, as well as kangaroo paws (Anigozanthos). Also take insects, mostly captured in the air but also gleaned from plants. Breed July to December, occasionally later. The rounded cup-shaped nest is placed in a shrub or small tree. Female mostly incubates the clutch of one or two eggs, but both parents feed young. Incubation and fledging periods not known. Not threatened, but has declined in northeastern part of range due to extensive clearing of habitat; also adversely affected by fire. Merops novaeseelandiae Gmelin, 1788, Queen Charlotte Sound, New Zealand. English: Parson bird; French: Tui cravate-frisée; German: Tui; Spanish: Pájaro Sacerdote. 10.5-12.5 in (27-32 cm); male 4.3 oz (120 g), female 3 oz (85 g). Dark, iridescent plumage with two white throat tufts. Back and flanks dark reddish brown. White collar and wing bars. 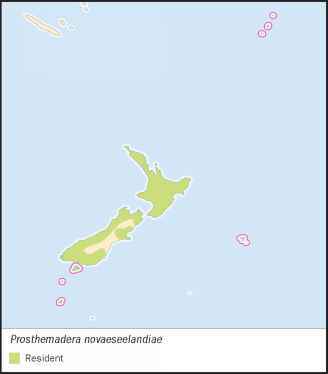 New Zealand, including North Island, western and southeastern South Island (patchy on the rest of South Island), Stewart Island, other offshore islands, Chatham Islands, Raoul Island in Kermadecs, and possibly vagrant on Snares and Auckland Islands. Podocarp, broadleaf, and beech forest, including remnants and regrowth. Also in dense exotic vegetation and in parks and gardens. Hold breeding territories and occur in loose groups outside breeding season, when males dominate females and tuis dominate other honeyeaters. May perform corroborees in small groups near the ground. Resident, but with local movements; more common in winter in urban areas. Males display song flights. Song is highly complex, and tuis have been deemed among the best singers in the world. The song is rich, melodious, and includes soft liquid warbling notes, bell-like calls, and chimes interspersed with sighs, sobs, coughs, laughs, sneezes, etc. Noisy flight is due to wing slots. Feed on nectar from a wide range of plants, including Met-rosideros, Fuchsia, and New Zealand flax (Phormium tenax). Glean insects, especially from foliage, and even sandhoppers (Amphipoda). Fruit is also an important component of the diet from late summer to winter. Honeydew is consumed from scale insects on beech trees. Breed mostly October to January. The large, untidy nest is placed in fork or shrub or tree. The clutch of two to four (occasionally five) eggs is incubated by the female. Incubation and fledging periods are about 14 days. Young are fed by both par ents, but more by female. Nests preyed on by introduced mammals and birds. Not threatened, but has declined in many areas during nineteenth and twentieth centuries due to habitat loss, hunting, and predation by introduced mammals and birds.